Small - $14.99 Only 4 left! Large - $14.99 X-Large - $14.99 Only 6 left! 2X - $14.99 Only 7 left! 3X - $14.99 Only 1 left! We've all watched Wonder Woman do some amazing things. We've seen her take down a battalion that had been in holding down a village for weeks, using mostly her bracelets and shield to make it through the barren battlefield. We've seen her wrap the lasso of truth around both villains and allies alike until they succumb to its magical will and admit the better path. We've seen her launch of shields, combat gods, and literally fly in the air from her own awesome might. But, have we seen her relax? They say the best villains are the ones you can imagine in repose. What about our hero? It's time to kick up some feet and relax after a long day of heroic rescues. 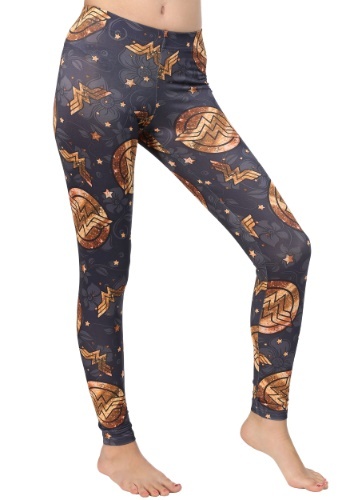 Whether you're Wonder Woman, herself, or just a loyal fan of her Amazon awesomeness, these officially licensed Wonder Woman Leggings are just the way to cool your invisible jets! These snazzy leggings have a dark gray background with golden Wonder Woman symbols and stars. You won't just be comfortable in these leggings. Whether you're on your way to Amazonian fitness or curling up with your favorite comic, you're going to be super comfortable!